I’m not sure why, but as we continue to trudge through the journey of Inyashiki’s story, I can’t help but feel a bit underwhelmed. There’s just something off about this show, and it definitely feels like something’s missing. Worse yet, the show itself feels like it hasn’t even gotten off the ground yet. 5 episodes in, nearly halfway through the series, that’s a serious problem. This far into the series, its kind of scary that I honestly have no idea what the show’s major appeal or reason to stick around is. 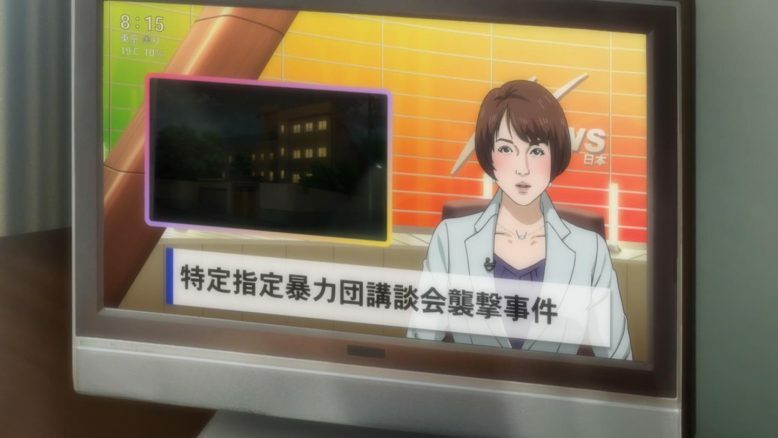 I mean, the news tells you how uninteresting the exploits of either character has been thus far. If anything, the one positive I can mention about the series thus far, is that both Ichiro and Hiro are both odd and unique characters. The problem, however, is that the show just isn’t doing anything all too interesting with either of them. Ichiro continues to use his powers for good, doing selfless things, while Hiro continues to serve himself and his own interests. And that particular dichotomy is something that the show more or less established in its first two episodes. The fact that we haven’t really moved on from that general notion, whether its via open conflict or some other different angle, is what bothers me the most right now. And Look, I get that this week had some forward momentum on the conflict angle. We did inch a little further toward some kind of breaking point for one of the characters this week, with the other one gaining some much needed back up. A lot of the progression, was actually thanks to none other than Ando, the kid that Hiro tried to “help” in the second episode of the series. Ando, for his part, reaches his own breaking point this week. The kid just can’t stand by and let Hiro continue to wreck havoc on random people, and so decides to do “something”, anything, about it. 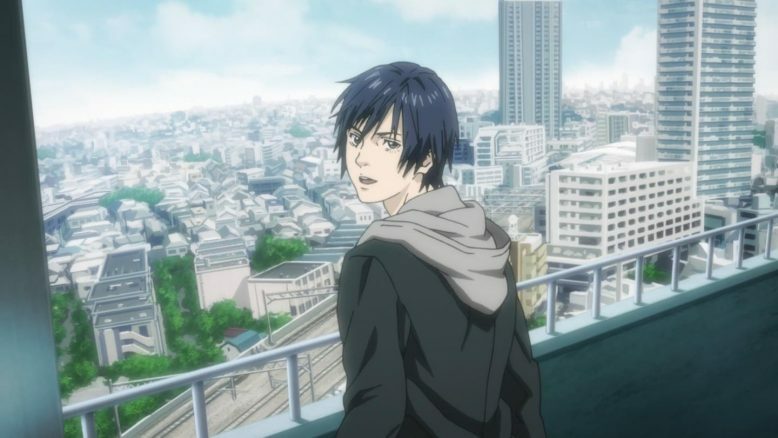 That something, it turns out, leads him to finding out about and meeting up with none other than Ichiro himself. Just a couple of bros hanging out, saving some lives… The usual. Ichiro, is the very person, the very hero that I think Ando always wanted Hiro to be. 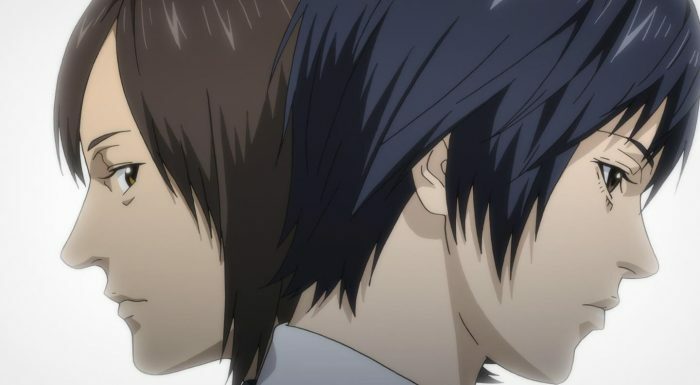 The alliance that forms between Ichiro and Hiro is definitely an interesting one, if somewhat odd none the less. You’d think that Ichiro would NOT want to involve a kid in his relatively dangerous work, but as events show, Ichiro needs all the help he can get. Ando is Ichiro’s side-kick in the story, and I can definitely say that it was fun seeing Ichiro and Ando work together. The episode’s highlights included the duo saving a terminally ill kid, and practicing with Ichiro’s powers in a junk yard, for instance. 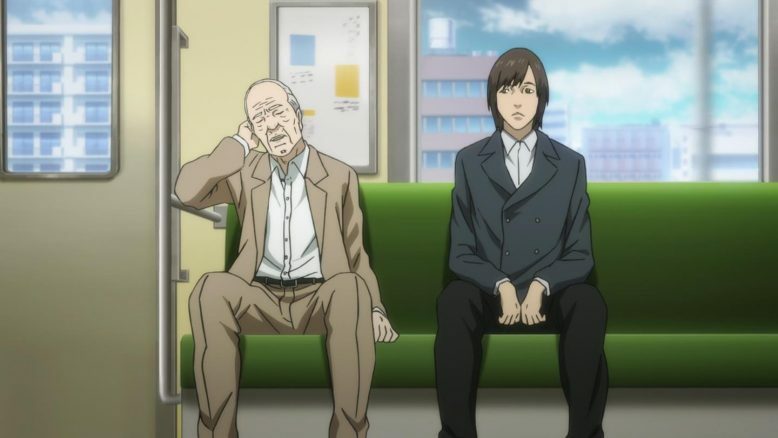 In fact, if Inuyashiki had followed its pattern from the last few episodes, than the show would’ve probably made the Ichiro and Ando pairing the focus of this week’s offering. Part of me kinda wishes it would have, because the other story line that was interlaced in this week, Hiro’s whole thing, was not nearly as endearing. Heck, I’d even go as far as to argue that Hiro’s storyline actively removed some of the impact from the big event of Ichiro and Ando coming together. I realize that I sound like a broken record here, but to me, Hiro continues to be a character that just rings hollow. I just can’t bring myself to care about him or his side of the story anymore. The sad fact is that, no matter what the show does, Hiro has committed such despicable and atrocious acts that he will never be redeemable, or even remotely sympathetic. 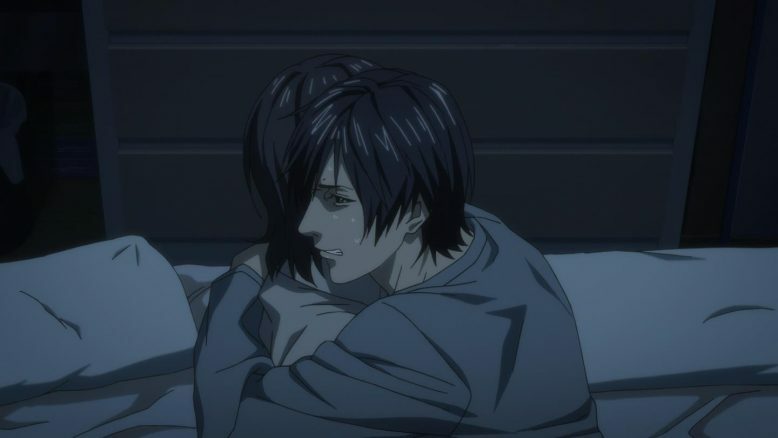 No matter how much he smiles, or how nicely he acts to his mother, I just can’t feel anything for the guy because of how cruelly and coldly he killed that one family in his introductory episode. So the moments where Hiro got confessed to by a girl in his class (and thanks her), the moments where he hangs out with his dad and step-siblings, the whole curing of his mom’s cancer? All of that just… felt empty and uninteresting to me. I think the show and story just wrote itself into a corner with Hiro, in that no matter what he does, there can be no positive emotions for the character. We needed this whole backstory to the kid earlier, and perhaps maybe then the shock of seeing him murder innocents may have been a bit more complex. And Personally, I almost wish the story would just double down on the fact that Hiro is some despicable twisted kid, because this whole contradiction that its been creating for Hiro, just muddies the waters for me and makes his character super bland. I can’t root for Hiro, and the show doesn’t want me to hate him either apparently, and the end result of that entire approach is just… Apathy. See, I get that Ichiro has to put Hiro down at some point, but I liken the situation to putting down a wild animal that’s hurt people. Its unfortunate but not entirely unexpected. So for me, the big showdown between Ichiro and Hiro that the show is building towards, seems pretty uneventful, at least as it stands right now. … When he really doesn’t. Thus far, the show is just barreling down the obvious path, with regards to Hiro. As we see this week, Hiro’s actions finally catch up to him. At the end of the episode, just as Hiro and his mother are about to move into their new life, just as Hiro decides to “stop killing people”, a bunch of men in suits (who I assume are police?) come in and try to capture him. Its all rather predictable though, isn’t it? Hiro’s been a loose cannon for a while, and hasn’t even been trying to keep himself incognito like Ichiro has. Thus, the fact that the police are raiding his home, is no surprise. Hiro’s mom, the reason why he will go full-time psycho, instead of part-time. Taking it a step father, I’d say that It also won’t be a surprise when Hiro kills all of them and goes off the reservation, because this is basically the show driving this wild animal into a corner. In that corner, the wild animal will attack, and with no one besides Ichiro powerful enough to stop him, the end conflict is pretty much predictable too. 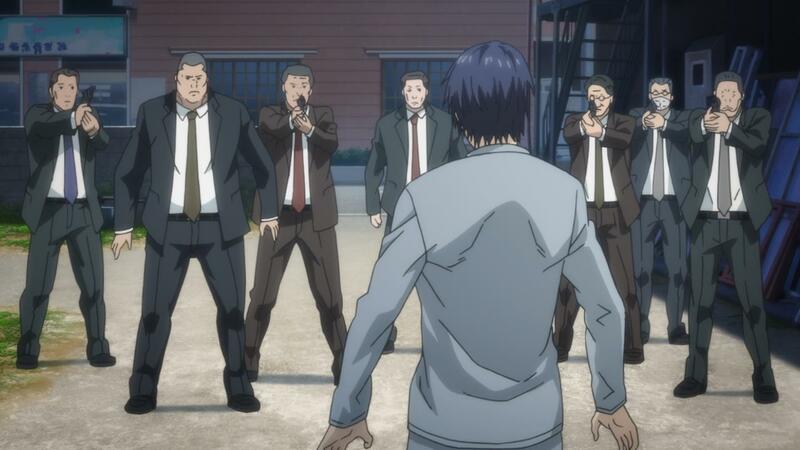 So… With that said, if everything is so predictable, and if there’s no interesting character dynamics, then I think Inuyashiki has a real uphill battle on its hands. Without SOMETHING interesting, unexpected, or emotionally powerful, the show can’t really entertain anyone, at least IMO. But I have to think, I have to believe, that there’s something in this story that will add some interesting wrinkle or nuance to an otherwise by the numbers story. 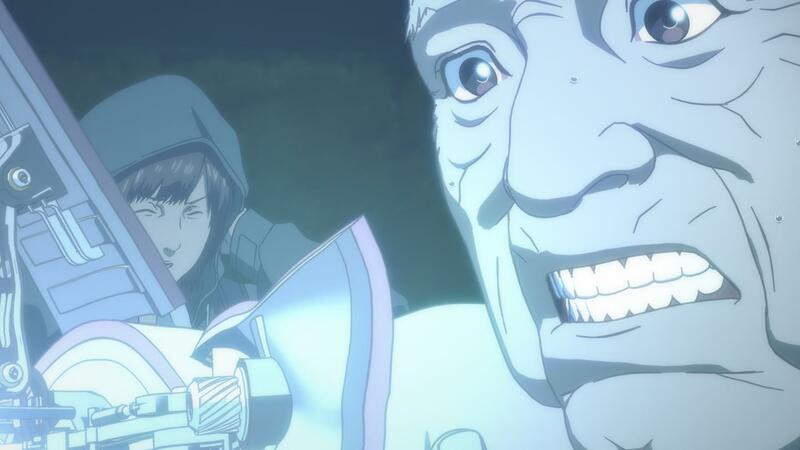 If not, then well… Inuyashiki will just settle into the place its currently at, a decent, well animated sci-fi show that will be entirely forgettable.